Checkline DIS-IP50 Tork Test Cihazı - Tork Test Cihazı - EgeRate Elektronik Mühendislik ve Ticaret Ltd. Şti. 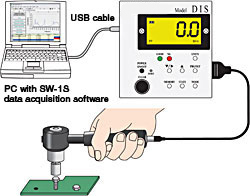 Calibrate your own torque wrenches and electric drivers and and save down time. Do not use with power drivers or impact tools (Ask for DI-1M impact wrench torque tester). 0.020 - 5 N-m 1/4"
0.20 - 50.00 N-m 3/8"
2.0 - 200.0 N-m 1/2"
2.0 - 500.0 N-m 3/4"